First, add the files to be renamed to the list. You can either use the selection dialog, or add the files/folders using drag and drop onto the program interface. 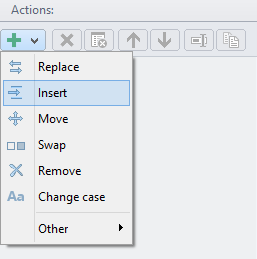 Click on the button featuring the plus (+) symbol to add the action Replace to the action list. The next step is to enter the text or character to be replaced. In the figure, the text "#img_" is to be replaced. Now enter the text that is to be used in place of the old text in the file name. In this example, the new text is "Norway 2011 - ". In the preview list, all changes are shown in real-time and are checked for errors (e.g., duplicate name) to avoid possible conflicts. If there are no conflicts, the Tasks dialog can be opened by a click on the Apply button. All files/folders to be renamed are listed there and the renaming process can be started by clicking on the Start button.